By Michael Poh in Culture. Updated on November 13, 2017 . We are born with the instinct to find meaning and purpose in our lives and this search for emotional well-being and stability in our lives gets more pressing year after year. In the last 45 years alone, global suicide rates have increased by 60% and some 350 million people worldwide suffer from some form of depression. Is it really that hard to be happy? Or are we looking at all the wrong places? Consider this: whenever we get the recognition, achievement, material possession, etc. which supposedly are the things that can make us happier, it wouldn’t be long before our satisfaction fades and we go about setting new goals to strive for in our lives. This in psychology is known as the happiness treadmill. We work hard in the hope to lead happier lives, but only to realize that we are still at the same spot on the treadmill. To be truly happy, we need to know how to get off this treadmill. Coined by Brickman and Campbell in 1971, this theory suggests that people adapt quickly to circumstances in life and eventually return to their baseline levels of happiness. In a study by Brickman, the happiness levels of lottery winners and paralyzed accident victims were found to be no different than the general population after some time from the event. The treadmill actually acts like a set-point for our happiness level. Whatever we encounter or experience in life, after a brief moment of happiness or sadness, our emotions will return to the baseline. While this protects us from being overwhelmed by negative events and getting stuck in depression mode, it is also the reason why we won’t be able to get our happily ever after. Our initial happiness and excitement will dissipate, and off we go looking out for the next opportunity which we believe will make us happy again. The Easterlin Paradox (proposed by economist Richard Easterlin in 1974) revealed that people in wealthier countries were no happier than those in less wealthy countries. A recent US research also found that beyond an annual income of US$75,000, any further increase in salary has no significant impact on our happiness level – at least for the Americans. Does this mean that money and other materialistic pursuits do not serve any long-term purpose in achieving happiness? Of course not. Having more money can make you happier. "The human animal is incapable of being satisfied except for brief moments. Once satisfied, it moves to the next need it needs to be fill." More often than not, money is particularly helpful at the bottommost two layers of needs in Maslow’s pyramid. Psychologist Abraham Maslow proposed in his hierarchy of needs theory (what you see below) 5 levels of fundamental needs. 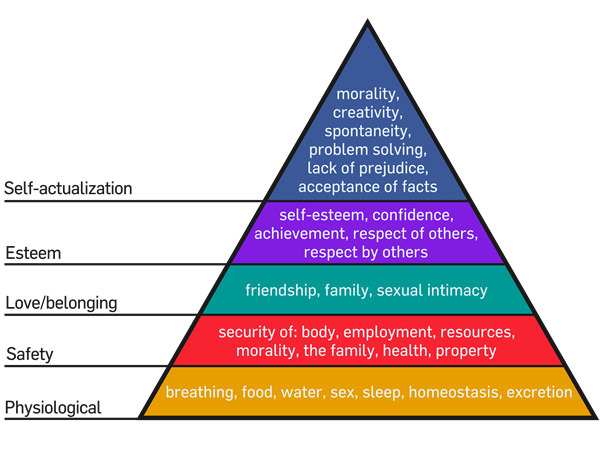 At the bottom of the pyramid is physiological needs, what we need to stay alive: air, food, water, sleep etc. Above that, safety, which includes personal security, financial security, health and fitness, etc. With our two bottom layer needs answered for through monetary means, we gain a greater sense of control and certainty over our surroundings. Beyond these two needs, we would attain the right frame of mind to look for and have happiness. Such peace of mind sets the stage for us to enjoy life’s moments and connect better with people, both of which are crucial components for beating that tricky treadmill. Going higher up the levels, money may not have the same impact on our well-being much longer. We can’t really fulfil love/belonging, esteem and self-actualizing needs with money, can we? But at least now, we are ready to be happy. According to University of California Riverside psychology professor Sonja Lyubomirsky‘s bestseller "The How of Happiness," a good 40% of how happy we are actually depends on what we choose to think and the activities we engage in on an ongoing basis. This is where what we choose to pursue in our lives matters and has the potential to help us escape the treadmill phenomenon. Depending on what we prioritize on in our lives and the decisions we make on a daily basis, our happiness set-point can change. There was a second part to the Easterlin’s findings in that what we earn actually is linked to our happiness. To be specific, Easterlin concluded that the relative income between us and the people around us is what determines our happiness. For example, if you earn $60,000 a year, you are happier in a country where the average annual income is $20,000 than if the average is $80,000. Sounds like a case of keeping up with the Joneses? You bet. Well, first of all, we should experience the present moment in our lives rather than focusing too much on the future or ruminating on our past. The present is what we truly possess and it is those activities which we choose to engage in that’s going to make us happy beings. So what can you choose to do today? In a psychology experiment by Emmons and McCullough, a group of participants were asked to write down 5 things which they are grateful for, once a week. After doing so for 10 weeks, the group ended up feeling better and more optimistic about their lives, and experienced fewer physical symptoms of illness. Check this benefits of gratitude list out to see what science has to say about the power of gratitude. This one also has some scientific truth in it. Exercise has been found to improve your mood, sleep and is a great stress reliever (as it reduces cortisol levels in the body). Exercising also releases endorphins and dopamine, the "happy chemicals" or neurotransmitters in our brain that allow us to feel pleasure and induce in us a sense of well-being. Check out more about this with regards to runner’s high, how moderate aerobic exercises can elevate moods, why physically active people experience more enthusiasm, and how exercise helps with depressed patients. Research has shown that performing random acts of kindness makes you happy. Actually, "altruism" should be the one getting the praises but in both cases, the key is to do random acts, not scheduled ones (which would dilute the effects). It’s probably no coincidence that most, if not all major religions endorse kindness and forgiveness as one of their core teachings. If you are working hard for a pay raise only to make it a materialistic pursuit (do you really need another smartphone?) then you are still trapped, but if you are aiming for it to spend on day-to-day activities or to build social relationships then research says that you are on the right track. Research has shown that people are happier when they make purchases to acquire life experiences (e.g. traveling, dinner with friends, etc) as compared to material possessions. The shared experiences embedded in our memory bank have a longer-lasting effect compared to one triggered by materialistic pursuit. Despite all the research findings and tips by experts, saying goodbye to that cunning hedonic treadmill for life remains a herculean task. We may find ourselves never finding a good answer to what life and happiness is about, and in turn, find the pursuit of happiness a lost cause. "Happiness cannot be pursued; it must ensue, and it only does so as the unintended side effect of one’s personal dedication to a cause greater than oneself or as the by-product of one’s surrender to a person other than oneself." In the 3 years as a POW in nazi concentration camps, he discovered that inmates who found meaning in their suffering and maintained hope of being released were the ones who eventually survived. After his liberation, Frankl went on to establish that the "will to meaning" is critical in attaining fulfillment in our lives. The emphasis lies not on oneself, but that of finding meaning in the day-to-day demands. It means taking responsibility in our actions and fulfilling our duties to the fullest. It means living in the present and answering life as it unfolds. "Happiness is like a cat, if you try to coax it or call it, it will avoid you; it will never come. But if you pay no attention to it and go about your business, you’ll find it rubbing against your legs and jumping into your lap."